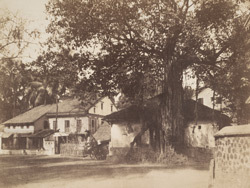 A view at Calbadavie [Bombay]. bl.uk > Online Gallery Home	> Online exhibitions	> Asia, Pacific and Africa Collections	> A view at Calbadavie [Bombay]. Photograph of Kalbadevi, Bombay from 'Views in the island of Bombay' by Charles Scott,1850s. The area of Kalbadevi was named after the shrine dedicated to the goddess Kali in this area. In the 18th and 19th century, Hindu immigrants from Gujarat, Kathiawar, Kutch and Marwar moved to Bombay to escape famine and drought in their homelands and settle in Bombay, where there was economic growth and prosperity. Kalbadevi was one of the areas where they settled. Some of the houses drew inspiration from Gujarat or Rajasthan, the areas where the residents came from. Kalbadevi was also a busy commercial centre with the Gujarati and Marwari Jewellers conducting their business and as a centre for trade in cotton and metals.